Let’s talk about mud running and masochism; soil and suffering; frolicking in dirt for the sake of health, fun, fitness and more besides. There’s a lot to say about the remarkable popularity and burgeoning industry of mud running (also known as obstacle course racing), and much has been written about pain as a socio-cultural phenomenon in sport and exercise, but I’ll mercifully (try to) stick closely to their entwinement here. I’ve been running in, writing about and otherwise researching mud running events for a couple of years now, and they don’t make for simple synopses. Suffice it to describe them as fusions of distance and trail running, adventure racing, and military-esque training, each event with its own distinguishing traits, ethos and intended demographic. You’ve likely come across marquee mud running events such as Tough Mudder, Spartan Race, Warrior Dash, or one of the scores of kindred smaller events flourishing in their shadows such as Dirty Dash or Mudd, Sweat and Tears. If you haven’t, then NBC’s recent televising of the Spartan Race and that company’s efforts towards professionalization and gaining Olympic status for obstacle course racing are intended to change that in the coming years. Differences between mud running events abound, but each generally comprises an obstacle course set over somewhere between five and twenty one kilometers through which everybody runs, jumps, climbs, leaps and otherwise perseveres, and by the end of which everyone is caked in the eponymous soil. So what’s masochism got to do with it? For a start, Tough Mudder’s somewhat satirical self-billing as ‘probably the toughest event on the planet’ alludes to the parodic soliciting of self-harm that this particular mud run exhibits and encourages. Tough Mudder is a half-marathon course that features obstacles such as the ‘arctic enema’ (an ice-filled receptacle into which participants submerge, pull themselves under a wooden fence and then, freezing cold and breathless, haul themselves and each other out) and the ‘electric eel’ (mud-laden tunnels lined with barb-wire, from which electrically-charged cables dangle onto crawling participants). It reminds me in these respects of MTV’s JackassTV series insofar as both feature people – mostly men, and mostly white depending on the location for the run – ironically disavowing while reasserting a heroic mode of masculinity by undergoing and yet overcoming solicited self-harm [Endnote/Box One]. 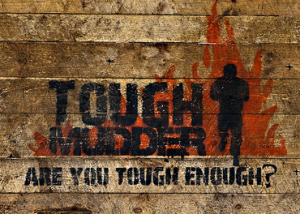 To underscore this analogy, Tough Mudder was the feature of an MTV True Life episode on the same weekend that the Spartan Race premiered on NBC in December 2013. The Spartan Race founders, meanwhile, claim that suffering is a moral and sacrificial right of passage en route to good, healthy, prosperous living in and through its events. 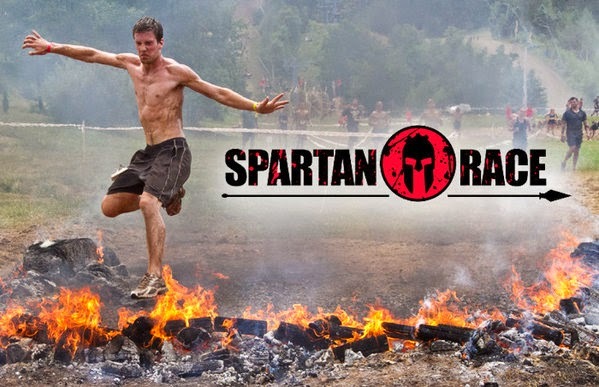 In various promotional materials Spartan Race intentionally and explicitly equates physical capabilities and psychological resolve with self-worth, both spiritually and economically. Suffering is a kind of redemptive undertaking in the Spartan Race’s ethos, intended to get people not only off the couch but back into a teleological line of human anatomical destiny (if you’re concerned that this sounds eerily like an almost eugenic movement lead by affluent professionals with time, money and calories to burn, your reservations are not unfounded). From Spartan Race Calgary. Relative to the socio-cultural, corporeal and phenomenological significance of pain identified in other studies of endurance sports [Endnote/Box Two], it seems to me that there is a pressing ethical question posed by mud running. Endurance, after all, means to struggle resiliently under adverse conditions, and the popularity of endurance as physical culture raises important questions about hardship in all its forms. Mud running, moreover, is a confrontation with pain and pursuit of suffering, however parodic, ostensibly morally-oriented or whatever the case may be, that is solicitedby the willing runner. And mastery of the terms of one’s hardship is always a privilege, unevenly distributed and too easily resourced for personal, heroic gains. These sorts of concerns lead historian Mary-Louise Adams to pose this question at a Congress of the North American Society for the Sociology of Sport: “Does the valorization of pain/suffering/endurance in sport make it harder to see the injustice in the need to endure in other spheres?” This question is imperative in a world where hardship is everywhere ongoing and unbidden, and in my own fieldwork at various mud running events I have contemplated similar, skeptical questions about the ethics of suffering, not least because pain is what is being sought, bought and sold. Nevertheless, I have found the different orientations to pain and suffering in mud running to be more nuanced, if not always less troublesome, than these soughts of questions tend to presuppose. People often use mud running events to confront traumas and hardships suffered by themselves and others that were not solicited. The courses become literal and metaphorical exercises in ‘overcoming’; they are a motor and a metric of strength, survival, resolve and recovery for people who are living with disease, injuries and illnesses. Many people running on behalf of loved ones and strangers, often – as in many forms of endurance running outside of the professional spheres – out of altruistic support, echo these sentiments. Complicating matters further still is that the spectacle of survivorship, resolve and endurance as a mode of overcoming through mud running has become part of the brand identity of respective events. For instance, Tough Mudderritualistically heralds wounded soldiers in a galvanizing start-line ritual to begin each heat of its events, and has raised over US$6m for the Wounded Warrior Project in four years. This brings mud running into critical proximity (despite spatio-temporal distance) with conflicts in which the imperative to endure is markedly different from – and yet substantively implicated in and connected to – events that popularize and commodify pseudo-military training. I don’t claim to write about ethics with any kind of authority or pretensions to a clear resolution, but I would posit that dismissing mud runs as trivial and inconsequential events for people who wouldn’t otherwise get their hands dirty misses the significance of what is happening therein. Even – perhaps especially – if this conclusion is largely affirmed by the promotional materials and most spectacular renderings of the practice. I’d also guard against conceiving suffering in atomistic terms, whereby some pain is authentic, and expressly or implicitly, and some is therefore not. In fact part of what I think makes it difficult to plot the connections between suffering here and there, present and past, is that it too often precedes with or results in a taxonomy or hierarchy of legitimate or worthy pain, and this is surely missing the point, and foregoing the promise, of such an analysis. Instead, I think the most important ethical insights are elicited when different orientations to and experiences of endurance, broadly conceived, are viewed as coming into contact in mud running events. With this sensibility I’ve taken to treating them as contact zones based around technologies – obstacle courses – that are historically infused with bio-political imperatives and in which people, nature, and technology commingle with matters of health, morality, and identity. Perhaps once I’m further down the rabbit hole in my own endeavors as runner-researcher, Courtney will kindly invite me back to say more about these paradoxically peculiar and popular practices. Endnote/Box One: I’m indebted to Sean Brayton (2007), and his article on ‘MTV’s Jackass: Transgression, Abjection and the Economy of White Masculinity,’ for this analogy. Endnote/Box Two: Studies of endurance sports such as marathons and triathlons in the past fifteen or so years have identified the pleasure felt in physical pain (Bridel, 2010), the heightened existential awareness or ‘symbolic death’ brought about through ‘extreme’ endurance sports (Le Breton, 2000), the social bonds fostered in and through ‘pain communities’ (Atkinson, 2007), and the cultural politics that arise when running as an act of individual altruism meets with corporate philanthropy (King, 2006). ReferencesAtkinson, M. (2008). Triathlon, suffering and exciting significance. Leisure Studies (27:2) 165-180. Brayton, S. (2007). MTV’s Jackass: Transgression, Abjection and the Economy of White Masculinity. Gender Studies 57-72. Bridel, W. F. (2010). “Finish… Whatever it Takes”: Considering Pain and Pleasure in the Ironman Triathlon: A Socio-Cultural Analysis. Unpublished Doctoral Dissertation, Queen’s University. King, S. (2006). Pink Ribbons, Inc.: Breast Cancer and the Politics of Philanthropy. Minneapolis: University of Minnesota Press. Gavin is a PhD candidate at the University of British Columbia, reading, writing, running for and otherwise researching a dissertation on mud running. In the scarce time that leaves he is either pursuing kindred research interests in militarization, political ecology, and cultural studies, playing soccer, or enjoying Vancouver before he goes searching for academic pastures new.